The Government of Japan has disclosed the immediate dispatch of an assortment of medical equipment valued at over two hundred eighty-eight thousand United States Dollars (US$288,774.00) to aid Liberia in its fight against the deadly Ebola virus. According to a Foreign Ministry release, the consignment of medical equipment and accessories will arrive in Liberia this Friday, September 5, 2014. The release named the items to be donated 100 pieces of tents, 500 pieces of sleeping pad, 500 blankets, and 25 generators. Other items expected to arrive include 25 cord reel, 30 pieces of water storage tanks, and 500 pieces of water containers among others. The donation will cover medical facilities in Montserrado, Bong, Lofa counties. 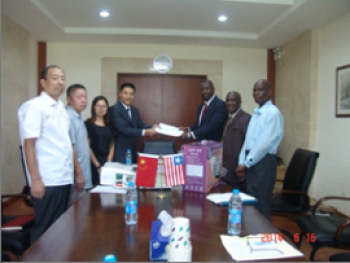 The John F. Kennedy Medical Center and the ELWA Hospital are the facilities targeted for the Japanese donation. The Japanese Government’s assistance comes as the country enters a crucial stage in battling the deadly Ebola virus that has claimed hundreds of Liberians’ lives while hundreds more remain sufferers of the virus. Previously, the Japanese Government had extended an “Emergency Grant Aid” in the tone of US$1.5 million to support the Ebola outbreak response in Liberia, Sierra Leone and Guinea that was challenged through the World Health Organization (WHO), United Nations Children’s Fund (UNICEF) and the International Federation of Red Cross (IFRC).